You say system, and not house. What do you mean by that? We’re a system, a way of thinking, not simply a product, and that is why we are different. 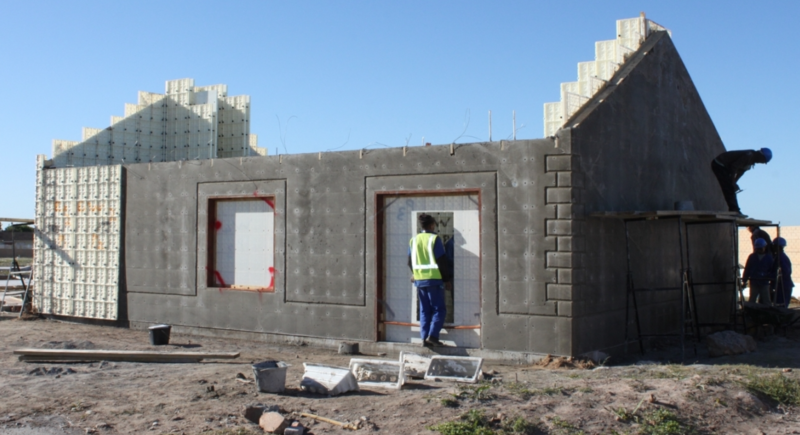 So the Moladi building system involves the use of a unique removable, reusable, recyclable and lightweight plastic formwork mould which is filled with an aerated SABS (South African Bureau of Standards) approved mortar to form the wall structure of a house in just one day. 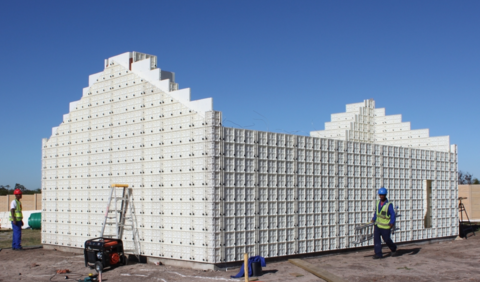 The process involves the assembly of a temporary plastic formwork mould the size of the designed house with all the electrical services plumbing and steel reinforcing located within the wall structure which is then filled with a specially formulated mortar mix to form all the walls simultaneously. 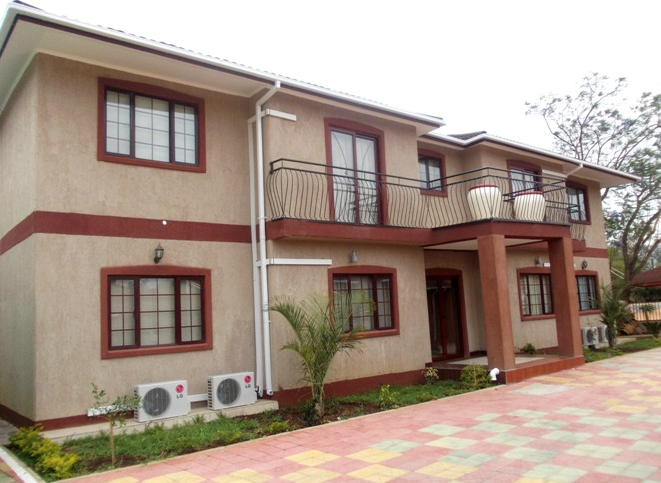 We use Moladi technology as a means to alleviate many of the cumbersome and costly aspects associated with conventional construction methods without compromising on the quality or integrity of the structure. When we first started, people would say things like Moladi structures won’t last. Now we have some that have been around for 30 years. From the very start, we were focused on solving the problem of affordable housing. I thought the world would chop a path to our doorway asking for the solution, but it has’t been that easy. 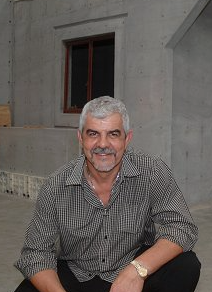 The masonry industry likes to protect its knowledge and its interests. Change has never been easy. But now things are changing. Whether through necessity or because of desperation, we are seeing more and more interest from private partners and governments that view us as a building block for the country’s future. We work hard to gain social acceptance from the local communities we work in. That is something that makes all the difference. Add to that the we are cost effective, we create local jobs, and we are environmentally sustainable, and you understand why we are now growing at a much faster pace. We’ve also added toilet systems, window and door systems, and kitchen systems to the Moladi system, all at a much lower cost than the hardware store. Now we are in a position to say that we’re world leaders at building entire village housing ecosystems. Are you finding interest for Moladi extends beyond Africa? Yes, that is most definitely the case. We have been in Mexico, in Panama, in Haiti, across Africa, and now we are in talks in Nepal. Moladi is currently deployed in 18 countries, reaching 20 within the next three months by adding India and Sri Lanka to our list. You know, all materials used in the construction of Moladi homes, other than the formwork, are sourced and supplied from within the local community. Other than contributing to the local economy, this drastically reduces the need for additional and unnecessary transport and handling of goods and building materials. 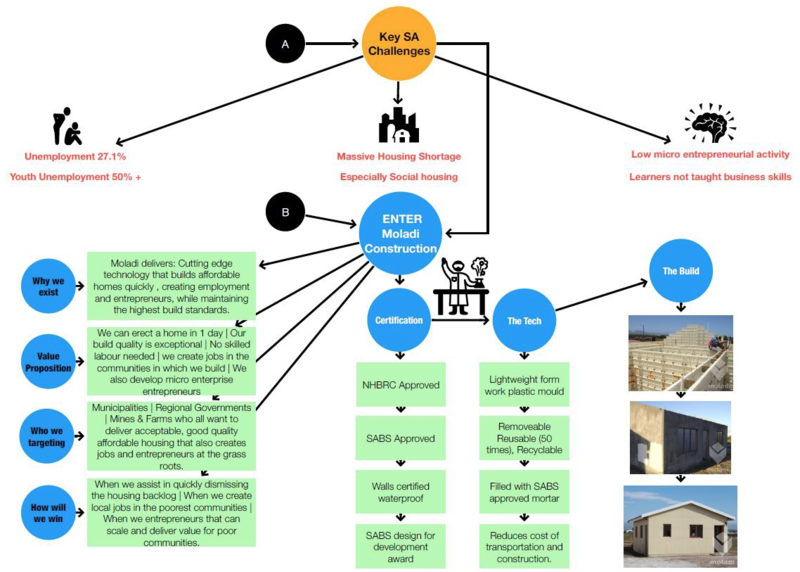 This follows from the logic that the fewer the number of operations, the higher the quality of the product, resulting in a predictive timeline and ultimately cost savings. Can you tell us about the local benefits of building a village with Moladi? For starters, the local impact is immediate. We are a major job-creation strategy at the local level. But most important is the change in the lives of Moladi customers. A house is still a castle. It is an asset for wealth creation and empowerment. We see three types of developments – upgrading informal settlements, green-field development, and rural village development. Governments now understand how critical infrastructure and housing is for a prosperous future, for lifting citizens out of abject poverty. That’s really why we do this. You mentioned sustainability. How are Moladi houses more eco-friendly than traditional building techniques? We have found that we are about 61% of the CO2 footprint for the same size of a house built with traditional brick and mortar. That’s because we don’t use bricks at all, and two, we recycle our moulds which are used to build 50 houses out of one set of moulds. Add to that the fact that a house is built in a day, and you significantly reduce material wastage. That in itself adds to both cost effectiveness, cycle time, and sustainability. We are expanding across the world. And we are not just housing for the poor. We think that decent, beautiful houses don’t have to be the province of wealthy citizens. That is why design and aesthetics are important as well. We want our houses to fill residents with joy and pride. It is not an accident that developers in the richer countries protect their markets from competition. But the world is getting smaller every day, and the tide is shifting. We want to partner with private companies across the globe, creating new business for them as well as us. Despite all the bad news you hear about in the news, I feel optimistic about the future, and the real impact Moladi is having on the war on poverty.